Mood swings in women are most commonly attributed to a hormone imbalance that occurs as you age, which can cause irritability as well as inappropriate emotional responses to stimuli in the form of an event or occurrence. This term also describes how an individual’s mood may shift between extremes rapidly—for example, going from excited and happy to anxious and sad in a short period of time. Continue reading to learn more about mood swings, including what causes them and how you can control and manage them. When a woman enters menopause, the hormones her body relies on to regulate emotion begin to fluctuate and cause issues with mood stability. Specifically, estrogen can either drop dramatically or climb exponentially and directly affect the body’s production of serotonin—a hormone involved in regulating mood. More than 50 percent of women experience mood swings as a symptom of menopause as there are changing drastically due to hormones. Other symptoms of menopause—such as hot flashes, night sweats, fatigue, and physical changes—may also affect the severity of these mood swings, though they are also tied to hormonal imbalances. Bipolar disorder: This is characterized by a constant flux between manic and depressive behavior that may cause severe mood swings in women and men. Lack of sleep: Not getting enough sleep can leave anyone feeling irritable and make it more difficult to deal with the normal stresses of everyday life. As a result, women who are unable to sleep for an adequate amount of time may be more anxious and irritable. Diet: Consuming excessive amounts of sugar and caffeine—potentially in a bid to combat the fatigue brought on by not sleeping enough—can cause mood swings, as they temporarily raise your energy levels then cause you to crash soon after. Hypothyroidism: Hypothyroidism is a hormone disorder that is more common in women than it is in men. The condition impacts the production of hormones that help the body to burn fat and gain energy, and the resulting hormone imbalance can cause mood swings. Some women may be more prone to experiencing mood swings than others, especially in relation to menopause. There are psychological, behavioral, and health factors that may put you at a higher risk for experiencing mood swings. These factors have been broken down below. Managing your mood swings may be accomplished through natural means or pharmaceutical ones, depending on their severity and your preference. Below are some of the most common methods to ease the frequency and severity of mood swings. Diet: Cut out caffeine, sugars, and alcohol if you can. These substances can impact your sleeping habits as well as your mood. Also, try to eat regularly throughout your day and avoid skipping meals to prevent any mood changes due to fluctuating blood sugar levels. Include a source of protein in every meal and try to avoid refined carbohydrates wherever possible to help stabilize blood sugar and mood. Exercise: Regular exercise—whether it is a high-energy spin class or calm yoga session—can help alleviate the stress that can cause mood fluctuations. Exercising regularly will lower your stress in a natural way and help stabilize your mood. Stay hydrated: Getting enough water will keep you hydrated and energized so that you aren’t tempted to reach for a cup of coffee or a sugary energy drink that can cause issues with your mood. Cognitive behavioral therapy: While it sounds complicated, cognitive behavioral therapy (CBT) can help change the way your mind deals with mood swings. It can be as simple as repeating a daily affirmation or making time to meditate so that you can reflect on what triggers your mood swings and how to avoid them. Medication: In some cases, you may find your mood swings are too severe and are having too large of an impact on your life and relationships to be managed through natural means. Have a conversation with your doctor in regards to these mood fluctuations, and depending on their cause, your doctor may prescribe a medication to ease symptoms. 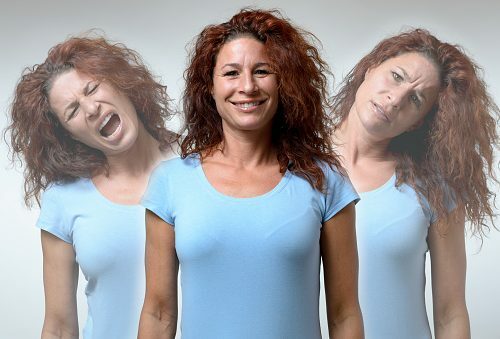 Mood swings are a common symptom of menopause and are experienced by many women. These drastic changes in mood can put a strain on daily life and relationships, so it is a good idea to understand what is causing them and how they can be managed. If changing your diet, exercising, and engaging in cognitive behavioral therapy do not seem to be effective, you may need to speak with your doctor about other options for managing mood swings, especially if they are frequent and severe.